COLD SPRING, MN – Cold Spring Brewing Company (CSBC), the #1 producer of exclusive beer and craft beer brands for major retailers throughout the world, announced the hiring of Audra Nistler as Director of Supply Chain. Nistler brings nearly 20 years of Supply Chain experience including purchasing, accounting, plant management and materials management. Prior to joining Third Street, Nistler held materials management positions with Elk River Machine Company in Elk River, MN and TCR Engineered Components, LLC in Brooklyn Center, MN. In her role as Director of Supply Chain, Nistler is responsible for managing the company’s two state-of-the-art warehouses—all 450,00 square feet—including overseeing all incoming and outgoing materials. 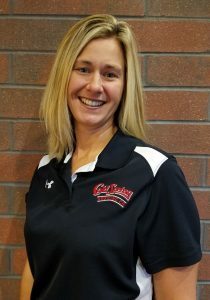 In addition to her experience, Nistler holds an accounting degree and certifications in lean manufacturing, as well as Certified Purchasing Professional (CPP) and Certified Professional Purchasing Manager (CPPM). 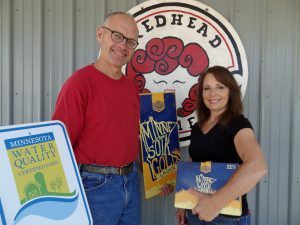 COLD SPRING, MN – Cold Spring Brewing Company, the craft brewery behind popular beers like Minnesota Gold Lager and Hop Lift, was awarded the Historic Business of the Year Award. “The Cold Spring Brewing Company and Third Street Brewhouse were selected for 2016 to recognize their long-time standing in the community as a business and supporter of causes that are important to the community. As one of Cold Spring’s major employers, their effect on the community is seen through their investment in building the new Third Street Brewhouse, their continued plans to grow, and for being a good place to work with many long-term employees,” said Rita Hennen, Secretary of the Cold Spring Area Historical Society (CSAHS). Shown are Trustees Bill Thull, Dan Steil, Rita Hennen; Historian Award Recipient John Decker, Historian Award Recipient Scott Bender (General Manager of the CSBrewing Company) and Trustees Cliff Johnson, Jim Dwyer, Dave Mehr, Don Jungles. Not shown are Trustees Ray Schouviller and Scott Larson. Pre-Prohibition Lager was sampled during the ceremony. The recipe for which was found hand written on a piece of paper from the early-1900’s. General manager, Scott Bender, was presented with a traveling trophy which will be displayed in the taproom at Third Street for the next year. Why not have hops everywhere? Long, long ago a grand tradition of brewing beer began as did the cultivation of the magical and integral ingredient hops. As people migrated to North America, so did hops. In fact, hop production in the United States closely followed the settlement of the first colonies. Early brewers used wild hops, but the cultivation of hops in Europe eventually spread to the new world. The major source of hops by the 1800s was in New York, but powdery mildew problems wiped out crops by 1909. The region revived again around 1920 with the discovery of sulfur-based fungicides only to be devastated again in the late 1920s by downy mildew. In the 1850s the hop industry moved west to Washington, Oregon and California. 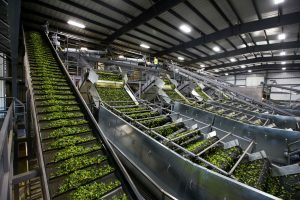 While California and western Washington no longer have significant operations, Oregon and Idaho account for about a fourth of U.S. hop production with the Yakima Valley providing the rest. The total U.S. production accounts for nearly 30 percent of the world hop crop. So why doesn’t everyone grow hops and brew beer? There’s a reason that Third Street Brewhouse doesn’t just start a field of hops out behind the Cold Spring Brewing Co. facilities – climate. “Minnesota is too wet to aggressively cultivate a crop,” said Karl Schmitz, the manager of Third Street Brewhouse. Hops are sensitive to moisture and develop mildew problems. 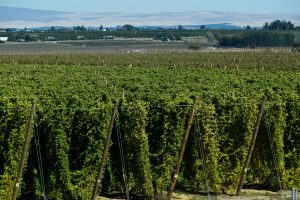 Climate is the reason why the Yakima Valley in Washington State is an ideal hop growing location; it’s a temperate desert. 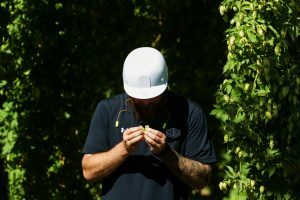 Schmitz and his lead brewer, Johan Sogge, saw that firsthand in late September when they visited the area where the majority of hops come from in the United States. The valley, located southeast of Seattle in south central Washington, is known for its fertile agricultural abundance. It’s top crop is apples, but Yakima is also known for cherries, pears, wine grapes and several other fruit and vegetable crops. This time of year, though, it’s hops. 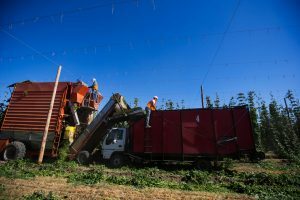 The desert-like conditions found east of the Cascade mountain range and the abundant snowmelt irrigation, along with long sunny days, means growing in the valley can produce a crop in the first year, a big incentive for those trying to break into the industry. “The air is dry,” Schmitz said. Farmers have tried to grow on a commercial scale throughout the country, including Minnesota and Wisconsin, “but mildew pushed them out,” he said. The average valley farm is 450 acres with most hop farms in Washington operated by third or fourth generation families. Most are diversified with fruit crops, including a burgeoning grape crop for wine production, and other traditional row crops. The majority of the American hop industry has been and continues to be family owned and operated farms. Third Street Brewhouse is proud to partner with the Minnesota Agricultural Water Quality Certification Program (MAWQCP), to recognize local farmers for the great work they are doing to protect our local water resources. 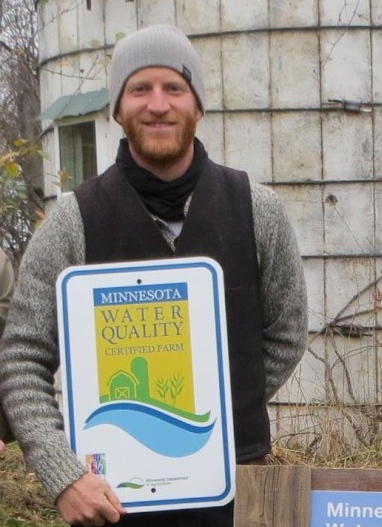 Local Sauk Centre farmer, Tyler Carlson, was the first in Todd County to be certified in the Minnesota Agricultural Water Quality Certification Program. Tyler and his wife, Kate Droske operate Early Boots Farm, a 200-acre farm on land formerly owned by Tyler’s grandparents. Early Boots Farm is home to a herd of grass-fed and grass-finished Lowline Angus beef cattle that are rotationally grazed on diverse pasture. The pasture includes perennial grass/legume mixes, red and white pine silvopastures, and native bur oak woodlands, where prescribed grazing is used as a tool to improve biodiversity and wildlife habitat. The cattle are moved through these various grazing lands to keep the herd on fresh forages and to allow for vegetative regrowth that improves soil health and water quality. The pasture nutrient management plan relies on a soil health program that has nearly eliminated tillage to establish the perennial pastures for rotational grazing with virtually no supplemental fertilizer purchases. Erosion is controlled with the abundance of perennial forage and woodland cover. As a sign of our support and appreciation, we’re happy to provide each certified farmer with a Minnesota Gold sign and case of beer. You can learn more about Early Boots Farm by visiting their website at: http://www.earlyboots.com/. Third Street Brewhouse (Third Street), is proud to partner with the Minnesota Agricultural Water Quality Certification Program (MAWQCP), to recognize local farmers for the great work they are doing to protect our local water resources. Local farmer, Russell Peterson of Grove City, is certified in the Minnesota Agricultural Water Quality Certification Program. Russell operates a 289-acre farm with a diverse crop rotation consisting of barley, alfalfa hay, corn and soybeans. His farm also raises beef (20 cow and calf pairs) and sheep (20 ewe and lamb pairs), utilizing a prescribed grazing program on pasture acres that includes four paddocks. Each paddock is grazed for one week followed by a 3-week rest period to allow for vegetative regrowth. Vegetative buffers are in place along waterways. Open tile intakes are to be closed as part of this water quality certification to further reduce sediment and nutrient transport potential. The nutrient management program follows University of Minnesota rate suggestions when applying livestock manure and supplemental fertilizer. Lastly, Russell is utilizing a reduced tillage program to maintain crop residue cover and works with local agricultural retailers for pest management control on his cropland acres. Third Street Brewhouse is a proud supporter of local farmers certified in the Minnesota Agricultural Water Quality Certification Program (MAWQCP), working to protect our local water resources. Jerry and Linda Jennissen, along with daughter Alise and her husband Lucas Sjostrom, operate Jer-Lindy Farms north of Brooten and became certified in the Minnesota Agricultural Water Quality Certification Program in August of 2015. They also operate an on-farm cheese plant called Redhead Creamery. Their dairy farm consists of 200 cows, 125 heifers and calves, along with several Lowline beef cows and calves. They grow corn for silage and alfalfa on 258 acres of owned and rented land. All the crops are fed to the dairy cattle and the manure is spread back on the cropland to supply all the nutrients without additional commercial fertilizer. This system is the perfect example of nutrient cycling and sustainability. All surface water has buffer strips in place to reduce the potential of sediment and nutrients affecting water quality. The Jennissen’s are also participants in the Conservation Stewardship Program and the Conservation Reserve Program. Other conservation practices implemented over the years include: replacing open tile inlets with rock inlets, farmstead shelterbelts, nutrient management, integrated pest management, reduced tillage, energy audit and energy improvements. The MAWQCP program has certified over 240 farmers in 55 counties, totaling over 140,000 acres in just over one year of statewide operation. The MAWQCP is a voluntary program that works with famers and local soil and water conservation districts (SWCDs) to identify and fix risks to water quality on a field-by- field, whole farm basis. 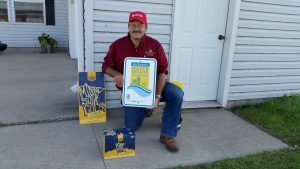 As a sign of appreciation, we’re happy to provide each certified farmer with a Minnesota Gold sign and case of beer. COLD SPRING, MN – One of the advantages of brewing beer in a close-knit community is the ability to collaborate with local organizations to craft exclusively unique beers. That’s how Third Street Brewhouse (Third Street), came up with their winter seasonal, Sugar Shack Maple Stout. Tucked in the backwoods of the legendary Saint John’s Abbey, in Collegeville, MN, rests a Sugar Shack operated by monks passing on century-old secrets. These guys take maple syrup making as seriously as we take great beer brewing, and they’ve given us exclusive rights to pair their notorious sweet blend with our perfectly crafted beer to create Sugar Shack. “This winter marks Sugar Shack’s fourth season in the market, and we feel very grateful that we’ve been able to continue this special partnership with St. John’s,” said Third Street Brewhouse Manager, Karl Schmitz. Sugar Shack will be released to retailers and on tap at bars and restaurants, starting November 5, 2016. But like all seasonals, there’s a limited supply, so “get it while you can,” Schmitz said. “Sugar Shack is a special brew that our customers look forward to getting their hands on every year because it embodies the sweet and roasted flavors of the winter season,” Schmitz said. Sugar Shack is delicately balanced with sweet and hoppy notes with distinct hints of roasted and specialty malts to produce a smooth, slightly creamy stout. Third Street brewers have found Sugar Shack to go well with pancakes, bacon, chocolate, or even hot wings – the sweetness will cut the heat. The new look captures St. John’s Abbey Arboretum Sugar Shack, where sap is boiled down to maple syrup. “The northern lights and snow are really neat concepts that catch your eye when looking at the can,” said Milbert. Look for Third Street’s Sugar Shack Maple Stout early November in 8-packs of 16-ounce cans and in their latest winter variety packs at your favorite retailer. Sugar Shack is also on tap at bars and restaurants across the state of Minnesota, as well as at the Brewhouse in Cold Spring, open on Fridays and Saturdays.